Downloading films from Youtube or other flashbased sites used to be rather cumbersome, but recently a whole lot of web services came to the surface that not only download youtube films for you, but also convert them -in this blog post you can find more information on Zamzar & youconvertit. 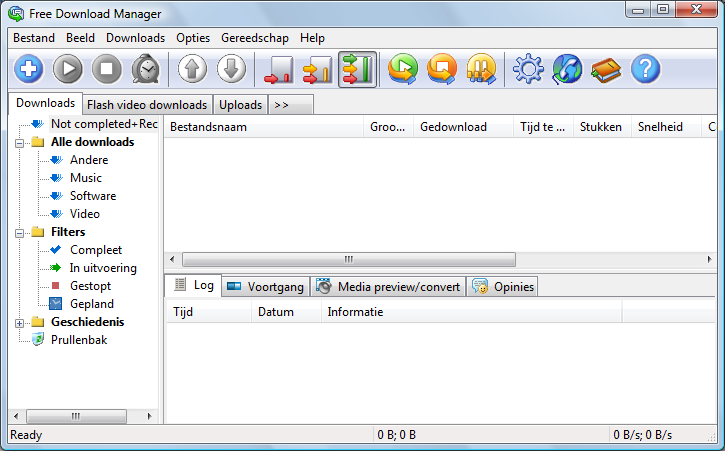 This time I want to point your attention to Free Download Manager, a nice piece of open source software which is at the same time also quite user friendly. Start up the programme and a wizard walks you through everything: entering your network settings, determining downloadspeed and the likes. Once all that’s finished, it suffices to enter the URL of the Youtubefilm you want to download and FDM takes care of the rest. Nuff said -or wait: maybe it’s interesting to know that you can download 20 files simultaneously. There’s also an auto resume in FDM, which -what’s in a name- nicely resumes downloads as soon as you’re connected to the Web. FDM allows you not only to download flash videofiles but also to convert them to any file format of your liking. WHat’s more, you can even adjust the resolution or the bitrate if you want. You won’t find exotic file formats among the compatible extensions, but the most popular ones are there: avi, wmv, mpeg, mp3, mp4, but rather surprising, no quicktime, which may be a disappointment for many. Those among you who want to start downloading entire websites will be interested in the HTML Spintool, which also allows you to determine how deep you want to go (link depth). You’ll find more candy here, such as a download manager which allows you to share your downloads immediately with the community. Is all pixel perfect here then? Well, not quite: torrent downloads are somewhat problematic, as FDM will keep on uploading, even if there are no active downloads, which isn’t such good news in terms of your bandwith. Speaking about which, you can only choose between three built-in settings: light, medium & heavy, but nowhere can you actually enter numeric values for up- or download traffic. In spite of these shortcomings, I still do think FDM is worthwhile checking out. This is a Faculty of Arts & Philosophy blog (Ghent University). Hopefully you'll find interesting stuff here. Come back regularly!